A small petrol station and truckstop by the Dones Green crossroads. The Lets Eat Cafe behind the forecourt. The service station started out as a 1950s garage called Tall Trees, in the corner of the crossroads at Dones Green. A transport depot opened up behind it, which became a full truckstop with its own restaurant. In around 1975 a house servicing that garage was extended to become the Lower Whitley branch of Little Chef. The building had a forecourt sales shop at one side, a restaurant at the other and accommodation upstairs. The motel was built in around 1988. 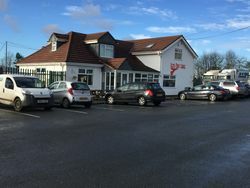 The Little Chef closed in 2005, and became an extended forecourt sales shop. 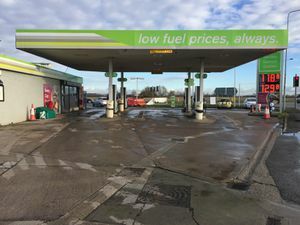 The forecourt has been branded Texaco, BP and now Applegreen, who call it Whitley service station. The direct access between the forecourt and the motel has since been closed off but the motel and truckstop still insist they are part of the signposted service area.